This is a must for anyone in Helsinki, travellers as well as residents. It can be visited any time of the year, but in the summertime you can enjoy the sea breeze at it's best. The cache is located appr. 3 meters deep in the ground: take a torch and good shoes for the tunnels. 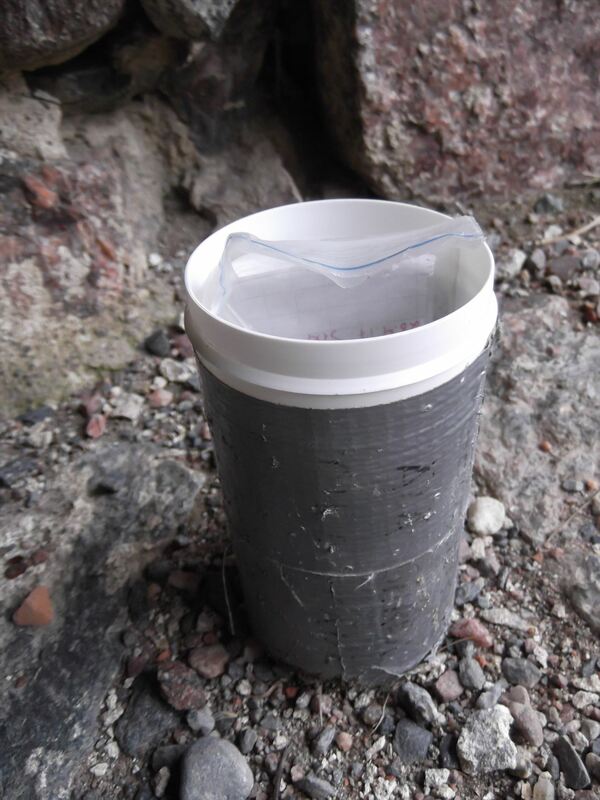 This is the first geocache in Helsinki, which I adopted on 21st September, 2008. The blue (and red) text are my additions, while the black is the original cache description. - Good hiding is essential. Please hide to container better than what is was when you found it. There are plenty of fist size rocks on ground to use. - Close the lid well to protect documents from humidity. - Do not roll the log. It fits in in straight position. (See image). - If maintenance is needed, report it in your log. Adoptoin tämän Helsingin ensimmäisen geokätkön 21.9.2008. Punainen (ja sininen) teksti ovat tekemiäni lisäyksiä. Musta teksti on kätkön alkuperäinen kuvaus. - Piilota kätkö hyvin. Siis paremmin kuin mitä se oli löytyessään. Maassa on paljon nyrkin kokoisia tarkoitukseen soveltuvia kiviä. - Sulje purkki tiiviisti, jotta paperi ei ime kosteutta ilmasta. - Älä kääri lokia rullalle. Se sopii purkkiin suorassa. (Kuva). - Ilmoita, jos kätkö kaipaa huoltoa tai se ei ole vinkin mukaisella paikallaan. The cache was re-established 27.04.2003. Please also check Suomenlinna ver.2. while in the neighbourhood. When you arrive to Helsinki by ship you will pass by this place. From the hide you can follow very near the giant passenger ferries sail through the narrows appr. 15 minutes after they leave their berth, check the timetables. Other ships pass any time. General information on Suomenlinna Fortress you'll find here and a map here.